. . . .” Hammond and Scullard (editors), The Oxford Classical Dictionary. (Oxford: Clarendon Press, 1970) 126. The deer and the cypress were sacred to her. In later Hellenistic times, she even assumed the ancient role of Eileithyia in aiding childbirth. Artemis later became identified with Selene, a Titaness who was a Greek moon goddess, sometimes depicted with a crescent moon above her head. She was also identified with the Roman goddess Diana, with the Etruscan goddess Artume, and with the Greek or Carian goddess Hecate. A hypothesis connects Artemis to the Proto-Indo-European root h₂ŕ̥tḱos meaning "bear" due to her cultic practices in Brauronia and the Neolithic remains at the Arkouditessa. Various conflicting accounts are given in Classical Greek mythology of the birth of Artemis and her twin brother, Apollo. All accounts agree, however, that she was the daughter of Zeus and Leto and that she was the twin sister of Apollo. An account by Callimachus has it that Hera forbade Leto to give birth on either terra firma (the mainland) or on an island. Hera was angry with Zeus, her husband, because he had impregnated Leto. But the island of Delos (or Ortygia in the Homeric Hymn to Artemis) disobeyed Hera, and Leto gave birth there. A scholium of Servius on Aeneid iii. 72 accounts for the island's archaic name Ortygia by asserting that Zeus transformed Leto into a quail (ortux) in order to prevent Hera from finding out his infidelity, and Kenneth McLeish suggested further that in quail form Leto would have given birth with as few birth-pains as a mother quail suffers when it lays an egg. The myths also differ as to whether Artemis was born first, or Apollo. Most stories depict Artemis as born first, becoming her mother's mid-wife upon the birth of her brother Apollo. The childhood of Artemis is not embodied in any surviving myth: the Iliad reduced the figure of the dread goddess, making her a girl, who, having been thrashed by Hera, climbs weeping into the lap of Zeus. A poem of Callimachus – the goddess "who amuses herself on mountains with archery" – imagines some charming vignettes: at three years old, Artemis asked her father, Zeus, while sitting on his knee, to grant her six wishes. Her first wish was to remain chaste for eternity, and never to be confined by marriage. She then asked for lop-eared hounds, stags to lead her chariot, and nymphs to be her hunting companions, 60 from the river and 20 from the ocean. Also, she asked for a silver bow like her brother Apollo. He granted her the six wishes. All of her companions remained virgins and Artemis guarded her own chastity closely. Her symbol was the silver bow and arrow. She was once bathing in a vale on Mount Cithaeron , when the Theban prince and hunter Actaeon stumbled across her. One version of this story says that Actaeon hid in the bushes and spied on her as she continued to bathe; she was enraged to discover the spy and turned him into a stag which was pursued and killed by his own hounds. Alternatively, another version states that Actaeon boasted that he was a better hunter than she and Artemis turned him into a stag and he was eaten by his hounds. In some versions of the story of Adonis, who was a late addition to Greek mythology during the Hellenistic period, Artemis sent a wild boar to kill Adonis as punishment for his hubristic boast that he was a better hunter than she. In other versions, Artemis killed Adonis for revenge. In later myths, Adonis had been related as a favorite of Aphrodite, and Aphrodite was responsible for the death of Hippolytus, who had been a favorite of Artemis. Therefore, Artemis killed Adonis to avenge Hippolytus’s death. Orion was a hunting companion of the goddess Artemis. 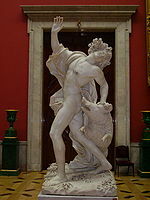 In some versions of his story he was killed by Artemis, while in others he was killed by a scorpion sent by Gaia. In some versions, Orion tried to seduce Opis, one of her followers, and she killed him. In a version by Aratus, Orion took hold of Artemis' robe and she killed him in self-defense. In yet another version, Apollo sent the scorpion. According to Hyginus Artemis once loved Orion (in spite of the late source, this version appears to be a rare remnant of her as the pre-Olympian goddess, who took consorts, as Eos did), but was tricked into killing him by her brother Apollo, who was "protective" of his sister's maidenhood. She was the daughter of Lycaon, King of Arcadia and also was one of Artemis's hunting attendants. As a companion of Artemis, Callisto took a vow of chastity. Zeus appeared to her disguised as Artemis, or in some stories Apollo, gained her confidence, then took advantage of her (or raped her, according to Ovid). As a result of this encounter she conceived a son, Arcas. Enraged, Hera or Artemis (some accounts say both) changed her into a bear. Arcas almost killed the bear, but Zeus stopped him just in time. Out of pity, Zeus placed Callisto the bear into the heavens, thus the origin of Callisto the Bear as a constellation. Some stories say that he placed both Arcas and Callisto into the heavens as bears, forming the Ursa Minor and Ursa Major constellations. Artemis punished Agamemnon after he killed a sacred stag in a sacred grove and boasted that he was a better hunter. When the Greek fleet was preparing at Aulis to depart for Troy to begin the Trojan War, Artemis becalmed the winds. The seer Calchis advised Agamemnon that the only way to appease Artemis was to sacrifice his daughter Iphigenia. Artemis then snatches Iphigenia from the altar and substitutes a deer. A Queen of Thebes and wife of Amphion, Niobe boasted of her superiority to Leto because while she had fourteen children (Niobids), seven boys and seven girls, Leto had only one of each. When Artemis and Apollo heard this impiety, Apollo killed her sons as they practiced athletics, and Artemis shot her daughters, who died instantly without a sound. Apollo and Artemis used poisoned arrows to kill them, though according to some versions two of the Niobids were spared, one boy and one girl. Amphion, at the sight of his dead sons, killed himself. A devastated Niobe and her remaining children were turned to stone by Artemis as they wept. Some myths say that their tears, which still flowed from their stone eyes, formed the river Achelous. The gods themselves entombed them. The Gigantes Otus and Ephialtes were sons of Poseidon. They were so strong that nothing could harm them. One night, as they slept, Gaia whispered to them, that since they were so strong, they should be the rulers of Olympus. They built a mountain as tall as Mt. Olympus , and then demanded that the gods surrender, and that Artemis and Hera become their wives. The gods fought back, but couldn't harm them. The sons even managed to kidnap Ares and hold him in a jar for thirteen months. Artemis later changed herself into a deer and ran between them. The Aloadae, not wanting her to get away because they were eager huntsmen, each threw their javelin and simultaneously killed each other. After the death of Meleager, Artemis turned her grieving sisters, the Meleagrids into guineafowl that Artemis loved very much. Artemis killed Chione for becoming too proud and vain after having an affair with Apollo at his request. Artemis saved the infant Atalanta from dying of exposure after her father abandoned her. She sent a female bear to suckle the baby, who was then raised by hunters. But she later sent a bear to hurt Atalanta because people said Atalanta was a better hunter. This is in some stories. Among other adventures, Atalanta participated in the hunt for the Calydonian Boar, which Artemis had sent to destroy Calydon because King Oeneus had forgotten her at the harvest sacrifices. In the hunt, Atalanta drew the first blood, and was awarded the prize of the skin. She hung it in a sacred grove at Tegea as a dedication to Artemis. Artemis may have been represented as a supporter of Troy because her brother Apollo was the patron god of the city and she herself was widely worshipped in western Anatolia in historical time. In the Iliad she came to blows with Hera, when the divine allies of the Greeks and Trojans engaged each other in conflict. Hera struck Artemis on the ears with her own quiver, causing the arrows to fall out. As Artemis fled crying to Zeus, Leto gathered up the bow and arrows which had fallen out of the quiver. Artemis, the goddess of forests and hills, was worshipped throughout ancient Greece.. Her best known cults were on the island of Delos (her birthplace); in Attica at Brauron and Mounikhia (near Piraeus ); in Sparta . She was often depicted in paintings and statues in a forest setting, carrying a bow and arrows, and accompanied by a deer. As Aeginaea, she was worshiped in Sparta ; the name means either huntress of chamois, or the wielder of the javelin ( ). She was worshipped at Naupactus as Aetole; in her temple in that town there was a statue of white marble representing her throwing a javelin. This "Aetolian Artemis" would not have been introduced at Naupactus, anciently a place of Ozolian Locris, until it was awarded to the Aetolians by Philip II of Macedon. Strabo records another precinct of "Aetolian Artemos" at the head of the Adriatic . As Agoraea she was the protector of the agora. As Agrotera, she was especially associated as the patron goddess of hunters. In Elis she was worshiped as Alphaea. In Athens Artemis was often associated with the local Aeginian goddess, Aphaea. As Potnia Theron, she was the patron of wild animals; Homer used this title. As Kourotrophos, she was the nurse of youths. As Locheia, she was the goddess of childbirth and midwives. She was sometimes known as Cynthia, from her birthplace on Mount Cynthus on Delos , or Amarynthia from a festival in her honor originally held at Amarynthus in Euboea . She was sometimes identified by the name Phoebe, the feminine form of her brother Apollo's solar epithet Phoebus. The ancient Spartans used to sacrifice to her as one of their patron goddesses before starting a new military campaign. Athenian festivals in honor of Artemis included Elaphebolia, Mounikhia, Kharisteria, and Brauronia . The festival of Artemis Orthia was observed in Sparta . Pre-pubescent Athenian girls and young Athenian girls approaching marriageable age were sent to the sanctuary of Artemis at Brauron to serve the Goddess for one year. During this time the girls were known as arktoi, or little she-bears. A myth explaining this servitude relates that a bear had formed the habit of regularly visiting the town of Brauron, and the people there fed it, so that over time the bear became tame. A young girl teased the bear, and, in some versions of the myth it killed her, while in other versions it clawed her eyes out. Either way, the girl's brothers killed the bear, and Artemis was enraged. She demanded that young girls "act the bear" at her sanctuary in atonement for the bear's death. Virginal Artemis was worshipped as a fertility/childbirth goddess in some places, assimilating Ilithyia, since, according to some myths, she assisted her mother in the delivery of her twin. During the Classical period in Athens , she was identified with Hecate. Artemis also assimilated Caryatis (Carya). The oldest representations of Artemis in Greek Archaic art portray her as Potnia Theron ("Queen of the Beasts"): a winged goddess holding a stag and leopard in her hands, or sometimes a leopard and a lion. This winged Artemis lingered in ex-votos as Artemis Orthia , with a sanctuary close by Sparta . In Greek classical art she is usually portrayed as a maiden huntress clothed in a girl's short skirt, with hunting boots, a quiver, a bow and arrows. Often she is shown in the shooting pose, and is accompanied by a hunting dog or stag. Her darker side is revealed in some vase paintings, where she is shown as the death-bringing goddess whose arrows fell young maidens and women, such as the daughters of Niobe. The attributes of the goddess were often varied: bow and arrows were sometimes replaced by hunting spears; as a goddess of maiden dances she held a lyre; as a goddess of light a pair of flaming torches. Only in post-Classical art do we find representations of Artemis-Diana with the crown of the crescent moon, as Luna. In the ancient world, although she was occasionally associated with the moon, she was never portrayed as the moon itself. Ancient statues of Artemis have been found with crescent moons, but these moons are always Renaissance-era additions. On June 7, 2007, a Roman era bronze sculpture of “Artemis and the Stag” was sold at Sotheby’s auction house in New York state by the Albright-Knox Art Gallery for $25.5 million. Remains of the temple today. 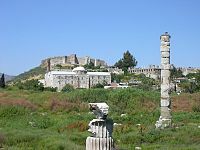 At Ephesus in Ionia (Turkey), her temple became one of the Seven Wonders of the World. It was probably the best known center of her worship except for Delos. There the Lady whom the Ionians associated with Artemis through interpretatio Graeca was worshiped primarily as a mother goddess, akin to the Phrygian goddess Cybele, in an ancient sanctuary where her cult image depicted the "Lady of Ephesus" adorned with multiple rounded breast like protuberances on her chest. They had been traditionally interpreted as multiple accessory breasts, or as sacrificed bull testes, as some newer scholars claimed, until excavation at the site of the Artemision in 1987-88 identified the multitude of tear-shaped amber beads that had adorned her ancient wooden xoanon. In Acts of the Apostles, Ephesian metalsmiths who felt threatened by Saint Paul's preaching of Christianity, jealously rioted in her defense, shouting “Great is Artemis of the Ephesians!” Only one of 121 columns still stand in Ephesus. The rest were used for making churches, roads, and forts. A minor planet, Artemis; a lunar crater ; the Artemis Chasma and the Artemis Corona (both on Venus) have all been named for her. As Selene she is associated with the Moon, and as Phoebe her name was borrowed for a moon of Saturn. Theoi Project, Artemis, information on Artemis from original Greek and Roman sources, images from classical art.